Macro Man has managed to get his hands on a pretty good dataset of global equity market sector returns. The amount of information contained therein is pretty daunting, and it may well take some time to sift through it for particularly useful pearls of wisdom- all the more so because he is quite keen to pick up the CTA proxy project that's lain dormant for the past few weeks. It's interesting to note that the US has generated the highest returns in every sector bar telecoms, where the Eurozone sneaks ahead. 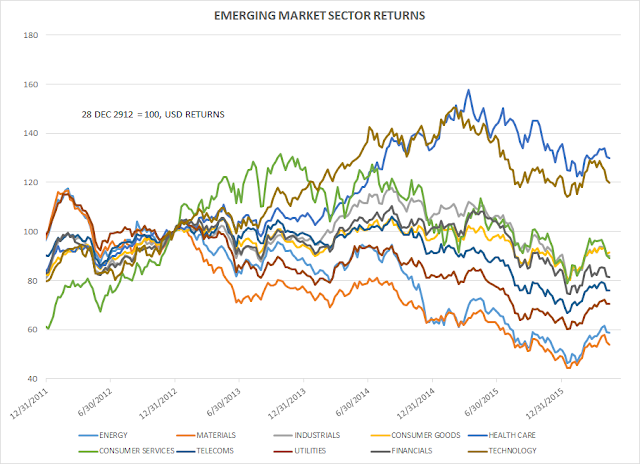 Part of this is probably a currency effect, as all of these returns are presented in US dollar rather than local currency terms to provide an apples to apples comparison. 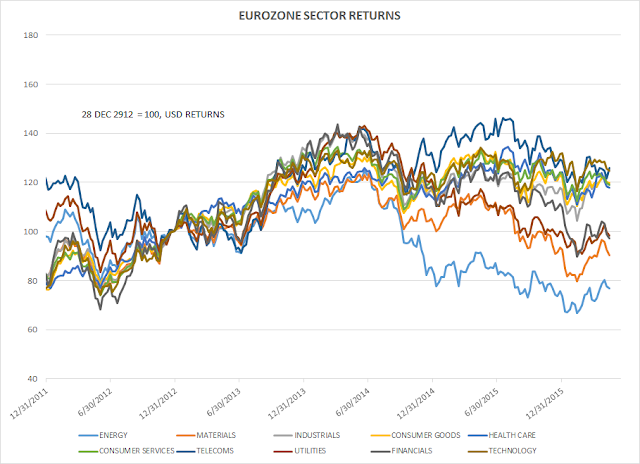 That being said, the magnitude of US outperformance eclipses that of the dollar move in many cases (for example, the USD is 14% stronger vs the euro since the end of 2012, but in most cases the US market returns relative to Europe are comfortably greater than that. 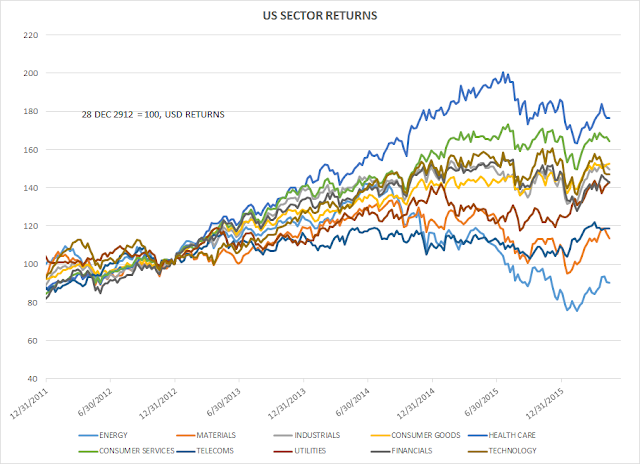 Are US firms that much more profitable? Is this the impact of financial engineering/buyback mania? Or are US markets the last refuge of the risk averse investor, requiring only the faintest nudge to topple over? 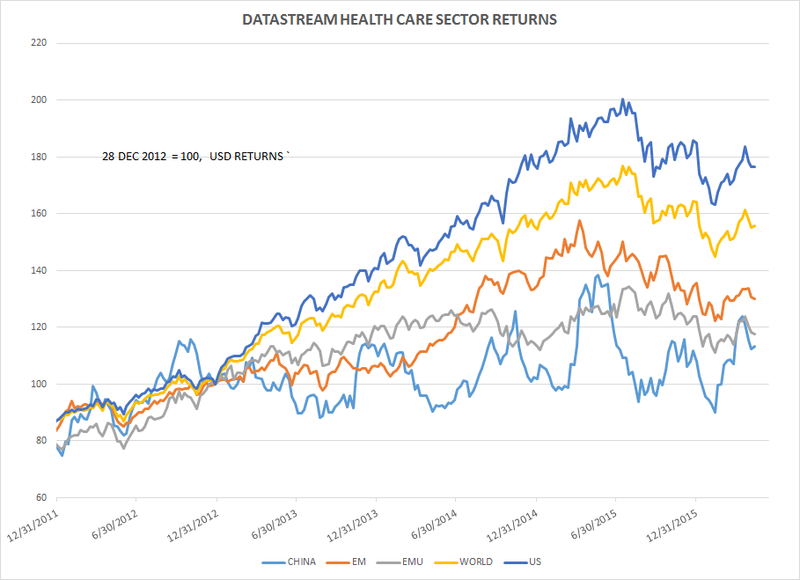 Macro Man has to confess that he didn't fully appreciate how well health care had done globally over the last few years (ex Pershing Square, natch.) Hell, it's even up in China since the end of 2012, the only sector that can make that claim. 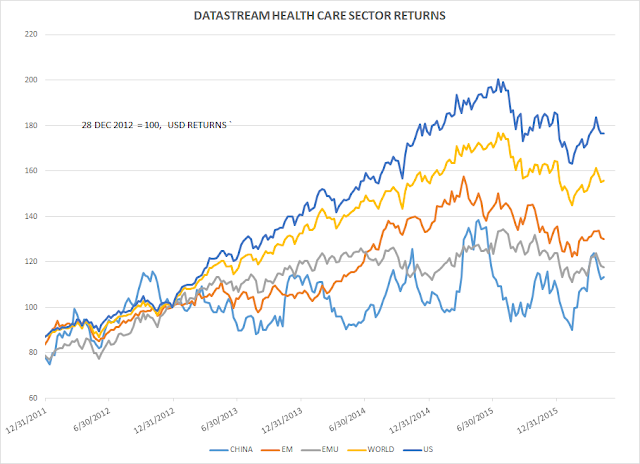 That being said, the chart of health care looks pretty ropy, particularly when you consider the scrutiny that Hillary Clinton's views on the pharmas are likely to recieve this summer as the campaign heats up. 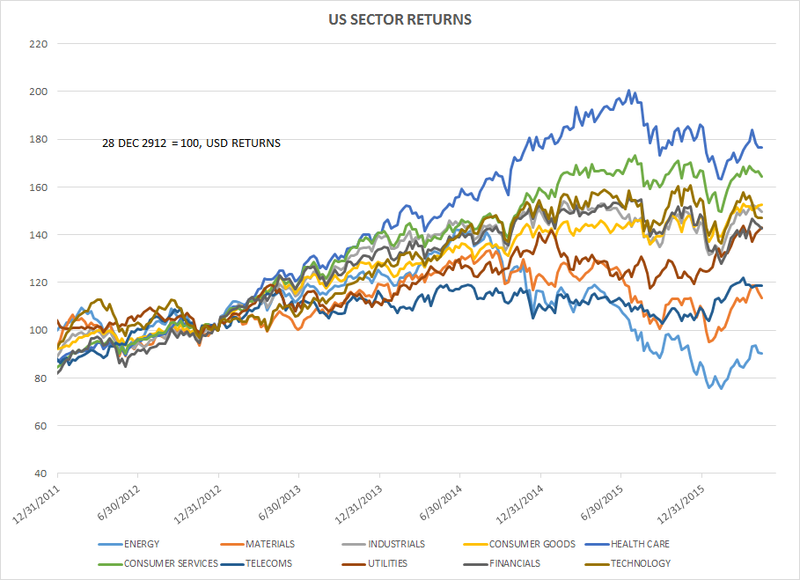 In any event, what's clear that there's been plenty of sectoral divergence even in markets that are going nowhere fast (like the SPX for much of the past couple of years.) 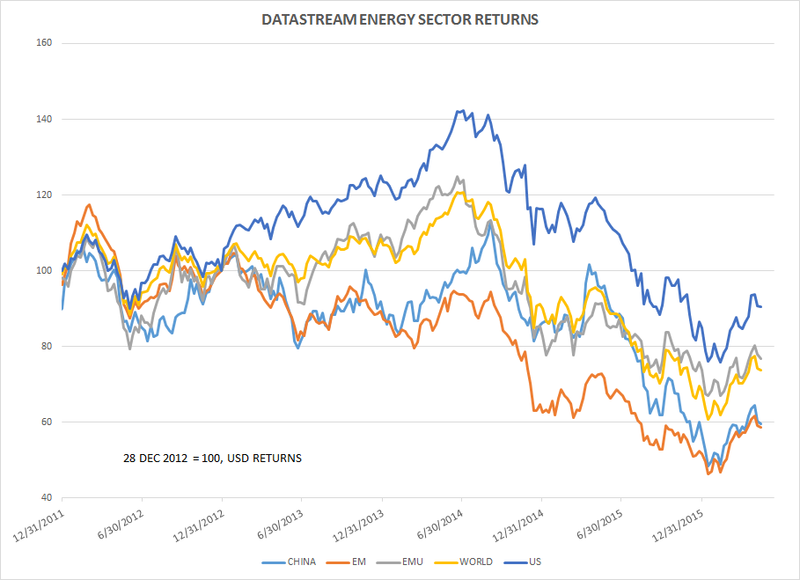 In the coming weeks, Macro Man hopes to run some deeper analysis and see if we can discern some insight into other macro factors from relative sector performance. Thanks for that MM. Really appreciate it. 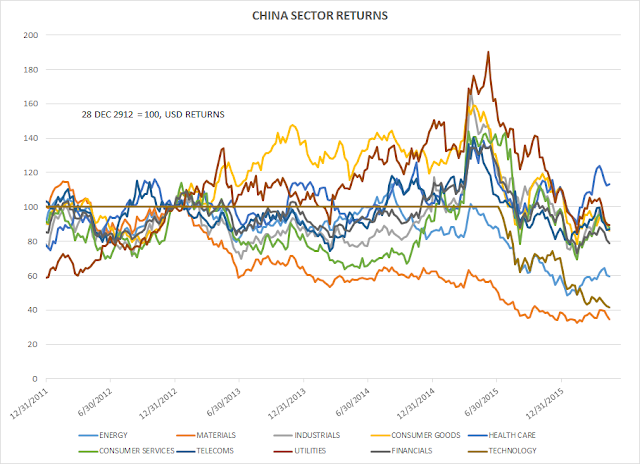 Further drives home the turnaround in China and EM's. Trend is not pleasant looking. Yet, in contrast, US holds steady. 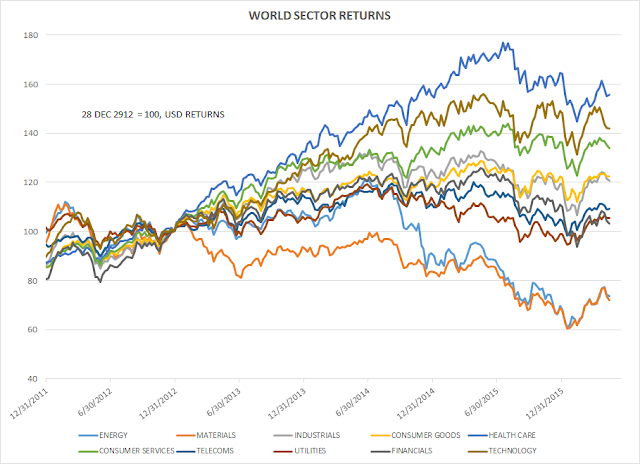 Regarding your question is the US market really better than the world in each sector, my answer would generally be that markets in the US are fairly priced relative to world wide peers. 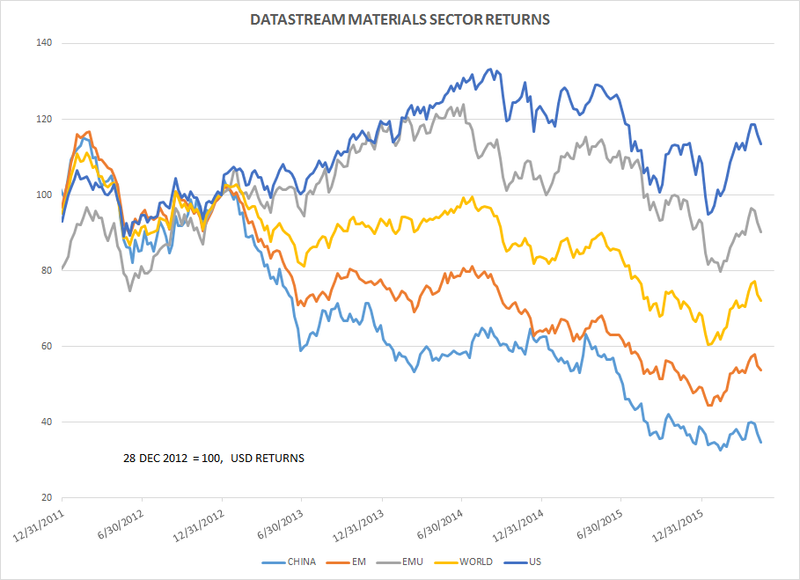 In Basic materials, for example, most of the US exposure is in Chemicals (paints, plastics etc) and not in the big miners like Rio/BHP/Vale. 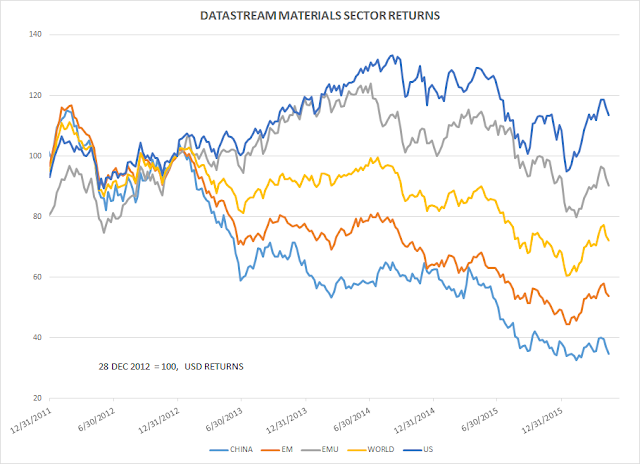 Chemical players world wide have similar valuations, it just happens that US basic materials is heavier weighted towards them. 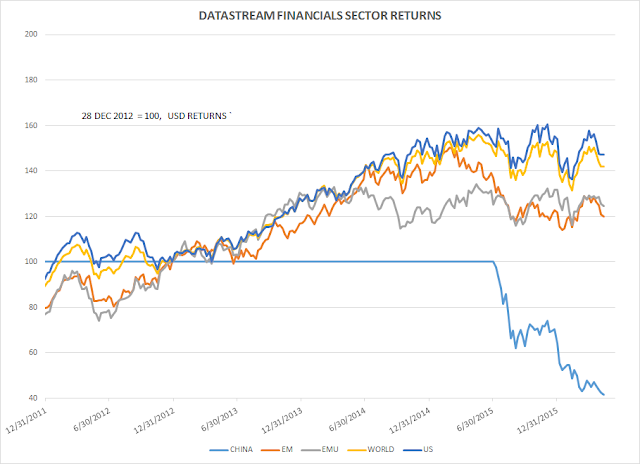 If you look at a data set from 2003-2008 you will see US underperformed. 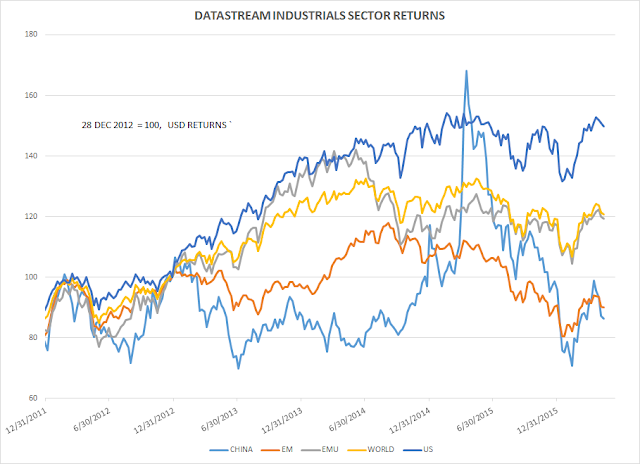 And if you look at EPS growth by sector, the US has outperformed generally over the past 5 years as well. There are similar stories for lots of other sectors. ConsDis has the heavy weight Amazon in it (in GICS at least) which skews everything vs EU/JP its weighted towards Autos. For something more globally comparable, banks, what you see is that banks generally trade on a PE/ROE regression. So while US banks might be more expensive than EU or JP banks, they earn higher returns which therefore justify higher valuations, even though the latter trade cheaper on p/b. The key to that line of analysis is that things stay the same. When the outlook is good for EU/JP, EPS estimates are rising and therefore you buy the companies with the most leverage to it. But lately as EPS estimates have fallen (sorry nose dived in the case of Japan, seriously WTF happened last Q, toyota?) you stay away. @MM bit curious why you would spend time on this (not that we are complaining) given its a bit removed from macro - the more interesting thing to me over the decades has always been how irrelevant all this stuff becomes when correlations go to 1, which, for obvious reasons, also happens to be the times that macro outperforms other strategies. The popularity of 'sector' investing seems positively correlated with cycle maturity. That said, thanks very much for sharing - I trust there will be useful insights to be debated, and I look forward. @Abee while we are o that subject. 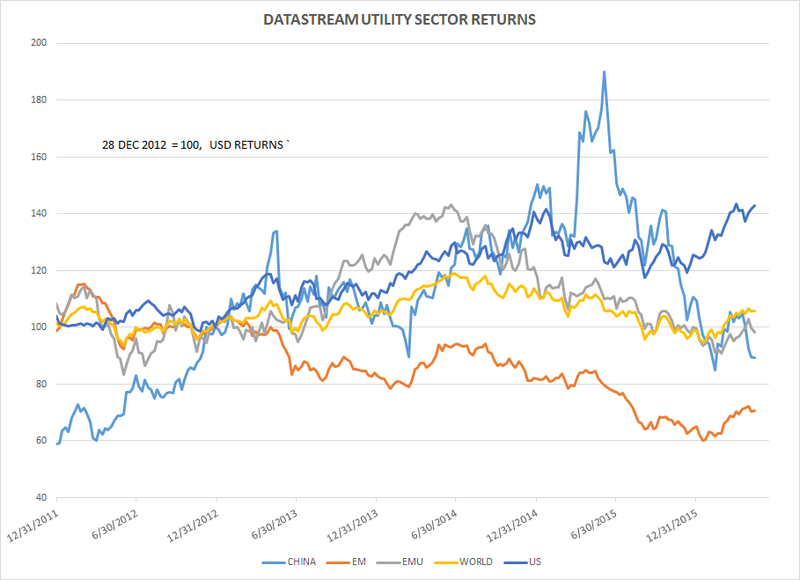 lots of chatter out there about how overvalued utilities are - do you share that opinion? 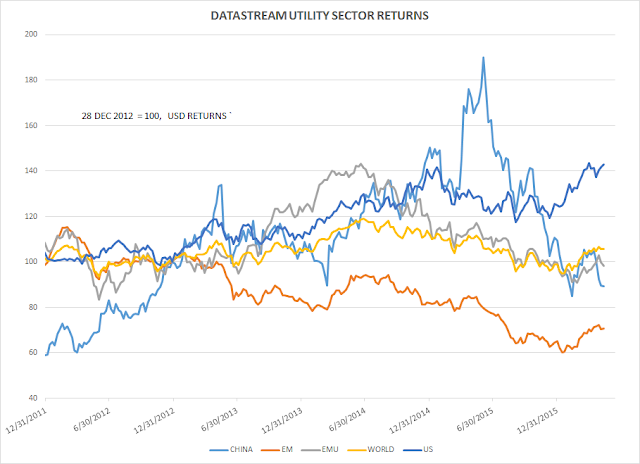 Utilities had another quarter of strong performance with the UTY up 15% on an absolute basis and 14% relative to the S&P. The increase is largely attributable to the decline in market expectations of near term rate hikes for the Fed, coupled with many portfolio managers being underweight the group at the beginning of the year. P/E multiples are testing highs for the group as yields relative to corporate credits seems to be driving the rationale for where the group is trading. 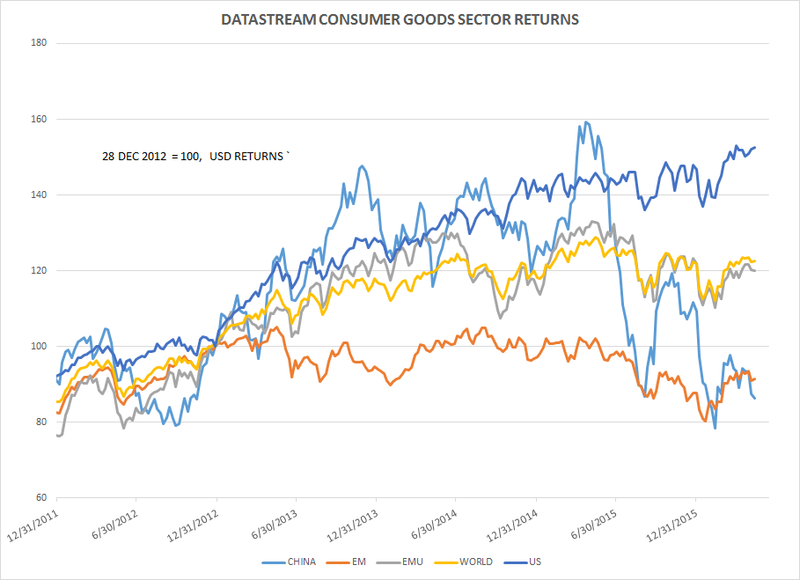 We are cautious on absolute prices given this dynamic, but think there are good opportunities for relative stock picks when the indiscriminate index buying subsides and fundamentals become a bigger driver of stock performance. tyvm abee - that makes sense - reminds me of q2/q3 2000 when utilities rallied oh about 40% as the nasdaq was crashing, before doing a wily coyote - classic example of how a fear bubble leads to stupid investment decisions much like a euphoric bubble. I'd argue that there's more "macro" in sector/industry bets vs the factor approaches. There are clear macro/political themes with healthcare and energy/materials that have played out over the last few years, with energy/materials feeding back via EM-issued/dollar-denominated debt constraints to EM/DM FX. 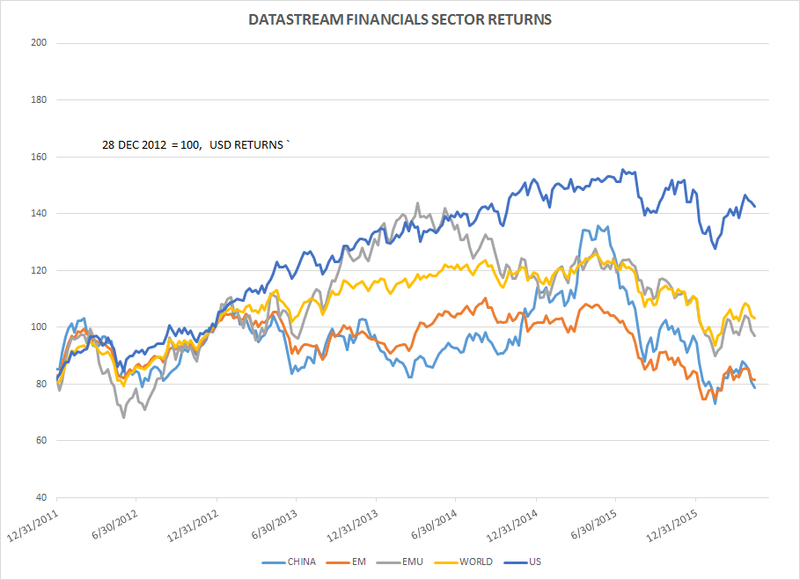 Clever use of macro data and sector differentiation makes it possible to do better than making broad brush statements about equities as a whole (is richness concentrated in one sector/industry with a great media story that retail is chasing ('00 tech top), or is it broader based (current mon-pol driven environment with compressed risk premia)? The factor stuff also poses some interesting crowding risks at this point... see the Momentum/Value reversion trade that JPM has been pushing (and called reasonably well). 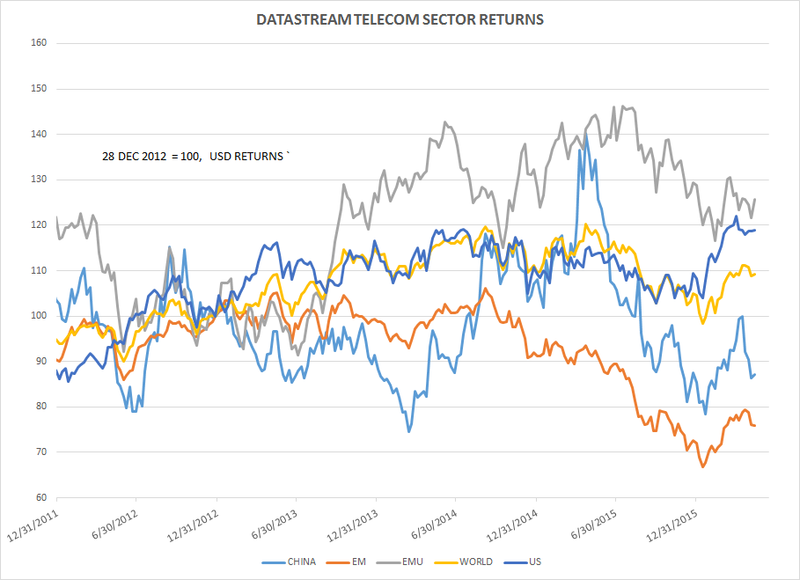 Polemic posted some interesting trades to think about yesterday. Thank you! Re shorting BTPs ... how to think about timing this? Municipal elections coming up in June and constitutional vote by October. I thought the latter might be a key event for this trade. My base case is a "remain" vote for the UK, but if it's "leave," it could well open the way for an Italian referendum. As for the banks, is the end-game here a run on an under-capitalized banking system that causes Italy to leave the eurozone? I understand that the new law on repossessions only covers new loans, so really does nothing to address the ~200b stock of NPLs the banks have. Just chatted with an ace European distressed analyst/friend who has looked at the Italian banks. His view is Atlante perhaps addresses some smaller banks, but the elephant in the room is Monte which he thinks is eventually merged with Unicredit. Probably a lot of vol on the way to that outcome though, with Monte shares crashing, but the real reckoning for the banks only comes in the next recession. Interesting to see Yellen yesterday scheduled a speech on June 6. If she wants to hike in June, she could use that event to jawbone up rates ahead of the meeting. 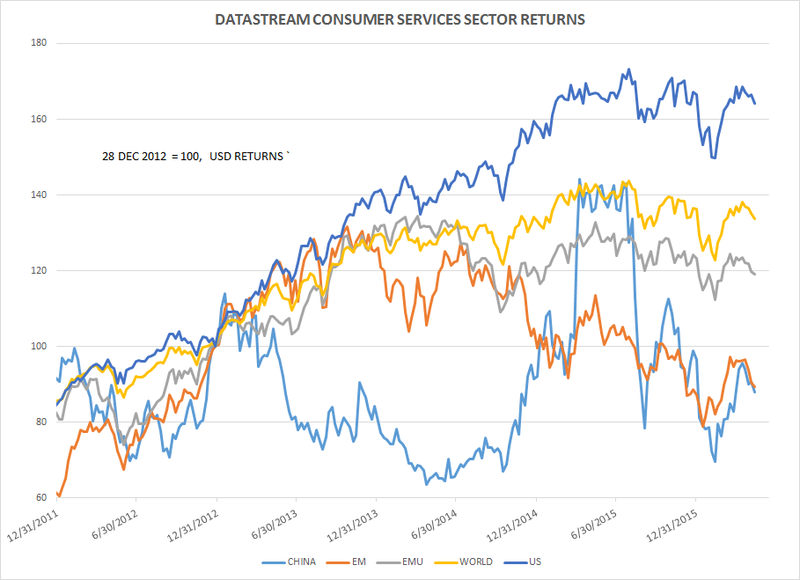 Equities down led by utilities and staples. Oil up, rates up. Stagflation Lite has always been a possible menu item at the Lower Bound diner, but it's a fad and it won't last long. The yield curve is telling us everything we need to know about durable inflation ahead. The next move up in the dollar, when it comes (and that may not be this week) will be very sharp and steep, and it will catch a lot of punters offside. Fear of Fed minutes tomorrow was the explanation for today's equity weakness. Expiration dead ahead, so a vanilla reading of the minutes may see shorts crushed once more, but perhaps for the last time this quarter. Btw the anon who was short IYR was on the money, that sector traded down hard today, and the punters in that arena are often a bit more informed than the average. Perhaps there is something coming in the minutes? We did nothing today. A low volume volatility crush and squeeze would not be surprising this week, but today's action was revealing - you can see that there are itchy trigger fingers out there poised above the sell button.